Oh, you trekked through Southeast Asia on your gap year? Well, Graham Hughes spent 1,426 days traversing 201 countries -- from Belarus to Samoa, Kazakhstan to Cape Verde and everywhere in between -- without ever getting on a plane. And for his troubles, he even won himself a Guinness World Record. Officially the first person to travel to every country on the planet without flying, the 33-year-old British traveler did it all by foot, bus, taxi, boat and train. It took Guinness World Records officials more than a year to recognize Hughes' achievement, requiring the organization to scour "1,000,000 GPS data points, 10,000 photos, 400 hours of video, and 192 passport pages," according to Complex. As stated on his personal website, Huges was "never one for the ‘normal’ 9 to 5 lifestyle." The Daily Mail notes that during his epic trip between 2009 and 2012, the Liverpool native reportedly lived off around just $110 (£65) per week. Check out the four-minute video Hughes put together documenting every stop on his world tour from one-second clips in each location, including his mediocre Australian accent. And note his increasing excitement/weariness as he approaches a staggering 160,000 miles traveled across the globe. 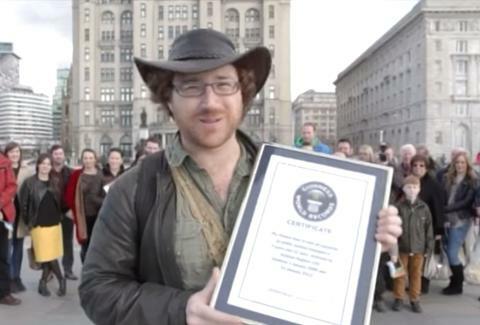 And here's a video Hughes made after finally receiving his Guinness World Record. Chloe Pantazi is an editorial assistant on Thrillist's travel team. Follow her travels to nowhere in comparison on Twitter at @ChloePantazi.